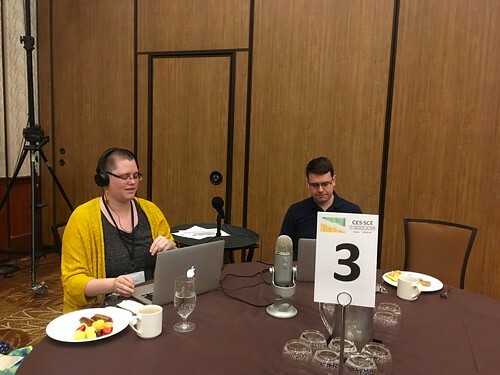 A few weeks ago, I went to an evaluation conference and at said conference there was the live recording of an episode of a podcast that I listen to: Eval Cafe. It’s hosted by a colleague of mine, Carolyn Camman, and her colleague, Brian Hoessler. The theme of the conference was “co-creation” so Carolyn and Brian thought it would be cool to co-create a podcast with whichever conference attendees decided to show up to their thematic breakfast session (which are sessions that are held on the last morning of the conference where the “presenters” suggest a topic of their table and people discuss it. So Carolyn & Brian brought their podcasting equipment and recorded the discussion of what we’d all experienced at the conference). And I was one of those conference attendees! Today is the last day of the Canadian Evaluation Society conference in Victoria. And, as I did yesterday and the day before, I’m using my blog as a dumping ground for my conference notes. For my regular blog readers, again please feel free to ignore these postings and I really, really promise to blog about whatever shiny thing happens to catch my attention again soon. Today is the day 2 of the Canadian Evaluation Society conference in Victoria. And, as I did yesterday, I’m using my blog as a dumping ground for my conference notes. For my regular blog readers, again please feel free to ignore these postings and I promise to blog about zombie uprisings again soon. but then they refocussed – their goal was to win the gold medal and to do that, they needed to be the fastest – the barrier was speed, not size. It opened them up to innovative techniques (like more training sessions per day and active recovery) and they did, in fact, get faster. used the Olympic mascots to represent different evaluation concepts and illustrated a timeline of Olympics & evaluation history in Canada. It was awesome! Today is the first full day of the Canadian Evaluation Society conference in Victoria. And, has become my custom, I’m using my blog as a dumping ground for my conference notes. Because that way I’m pretty sure I’ll be able to find them when I want them later (as opposed to them being on paper in some paper folder that I can’t use Google to search ((Google, when are you going to start indexing my paper files already?)! So, for my regular blog readers, please feel free to ignore these postings and I promise to blog about dog Snuggies again soon. Is there a synergy between program evaluation and quality improvement? Erica raised the question: should the relationship between the practices of evaluation and quality improvement be formalized? e.g., should QI be the 5th Program Evaluation Standard or a substandard under “Utility Standards” (ensure evaluation serves information needs of intended users)? planning cycle integrates all levels of managers; integrates quality improvement, risk management, etc. A long time ago in a galaxy far, far away1, I used to teach classes using Problem-Based Learning and an important part of my role was to guide students through self- and peer-evaluation of group work. We used a format called “SIR” where you identified a Strength of the student’s performance, something they needed to Improve and a suggested Remediation to make that improvement. Often, students (and teachers) would call the “area for improvement” a “weakness.” At first, I struggled to come up with what I thought were the students “weaknesses” – it just seemed so negative and judgmental. But then one day while talking to one of my colleagues, she said that she didn’t think of the “area for improvement” as a weakness at all – it was a way to challenge yourself. An opportunity to get better at doing something. Maybe you were functioning in a group in a certain way and it was not working – it wasn’t a “weakness,” it was an experiment and next time you’d experiment in a different way. Maybe you’d been focusing on one aspect of group process – like sharing information that you had – but next time you want to challenge yourself to work on a different area – like drawing connections between the information that others were sharing to better inform your approach to the problem the group was tackling. This small shift in thinking about “areas for improvement” was a monumental shift for me – it made providing feedback a much more positive experience and I had so many more possibilities on which to draw when providing feedback to groups of students! Today I had a similar experience, where a small shift in thinking – in this case, substituting one word for another – has really opened my eyes. I was interviewing someone for an evaluation I’m working on and after asking her what her group’s strengths in working towards a certain goal were, I asked her what she saw as the barriers to achieving that goal. In her answer, she described the “hurdles” that her team had faced. Not barriers. Hurdles. And it struck me that though this was just a small word change, there was a subtle, but important, distinction. Barriers keep people from progressing, but hurdles, well, you can overcome hurdles. Using the word “barrier” gives the sense that you aren’t going to get past it, while “hurdle” suggests that even though it will take work, there still an assumption you can get over the hurdle. Just like I now think of “strengths” and “opportunities to improve” instead of “strengths” and “weaknesses,” from now on in my evaluations I’m going to ask people to talk about the things that help them progress and the hurdles – not barriers – they have faced. The CES encourages evaluators and related professionals to join this tradition of sharing a spirit of ever increasing openness to knowledge diversity. Evaluation professionals from governments, post-secondary institutions, private practice, non-profits, and the voluntary sector will come together to discuss, debate and learn from each other. CES members will discuss the latest developments in evaluation in Canada. As well, we invite non-members and evaluators from outside Canada to share information and their experience on evaluation initiatives. We expect participation from colleagues in health, education, environment, natural resources, social sciences, and economic and community development sectors among others. Also, I just so happen to be the Volunteer Coordinator for the conference, so if you just so happen to be a student who is interested in attending this conference, you will want to keep reading. In exchange for a minimum of 4 hours of volunteered time, students will have their registration fee for the conference waived (note: this doesn’t include pre-conference workshops or other extras). a variety of other tasks, as needed, to ensure that everything runs smoothly. Any interested students should contact me as soon as possible. Volunteer spots will be given out on a first-come, first-served basis. Also, if you aren’t available for/interested in volunteering, but would like to attend the conference, there is a considerably reduced registration fee for students1!